MUNERs! Do you remember the Kaamelott committee? Time for you to discover what our brand new special committee will be! Wizengamot is the wizard Court of Justice seen in the Harry Potter saga. It is the British magic high Court of Law dating back to the days of the medieval Wizards’ Council. Its administrative headquarters are located in the Departement of Magical Law Enforcement of the Ministry of Magic. Trials take place in the dungeons of the lower levels. One of the most notable trial was the disciplinary hearing of Harry Potter. 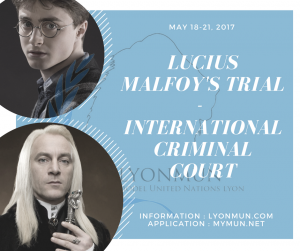 You’ll find here guidlines for your Position Paper and the Rules of Procedure for the LyonMUN 2017.